Located in southwestern St. Charles County, Klondike Park is a 250-acre park, acquired by the County in 1999. This park lies adjacent to Highway 94, the Katy Trail and the Missouri River. 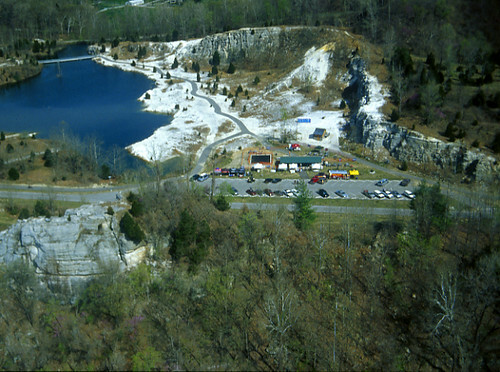 In the past, the Klondike Park site was the scene of quarry operations to mine the high-silica sand, and is a study of nature's resiliency. There is a surprisingly wide range of trails in this park for a rather small area. 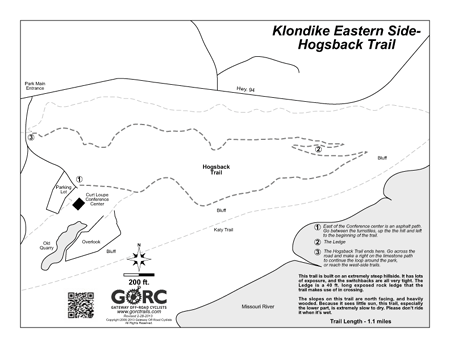 It can be divided roughly into 2 sections: the western side with the Powerline, Strip Mine, Donjo's, and Donkey Kong trails; and the eastern side with the Hogsback trail. Both of these sections can be ridden as a complete loop by making use of some of the paved and gravel bike paths in the park. 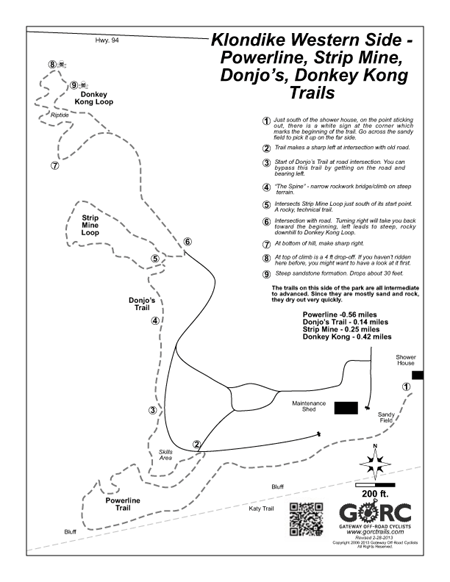 The trails on the western side are for the most part, rockier and more technical, featuring the flowy, curvy Powerline trail, and the advanced, uber-technical Strip Mine and Donkey Kong trails. Nearly everyone will end up putting a foot down, or even walking some sections of these trails. They are not recommended for beginners, but will prove a challenging and rewarding ride for more skilled bike handlers. 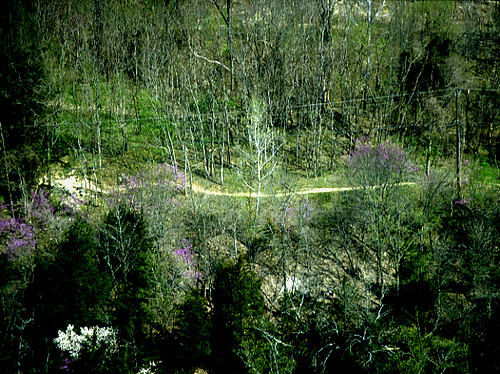 The newest addition to this side of the park is Donjo's trail, which makes use of some major rock-work and steep cuts into the side slope to allow a more gradual elevation change in reaching the Strip Mine trail from the Powerline. 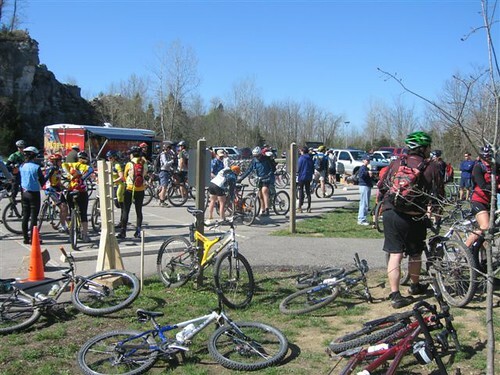 On the eastern side, the Hogsback will take you on a thrilling ride beginning on top of the bluffs, and sending you rapidly down a screaming descent with super-tight switchbacks, a 40 ft. sandstone ledge, exposed slopes and even some short but tough climbing near the bottom. Because of the sandy, rocky soil on the western side, these trails generally drain well, and can be ridden fairly soon after rain. The Hogsback, however, is on a north-facing slope and the lower areas see little sun and are very slow to dry. It can be very muddy and slippery, so it's recommended to avoid it immediately after rain. Some technical skill structures are being added to the park. Two teeters and 2 drops have been constructed on Powerline already with more to follow. 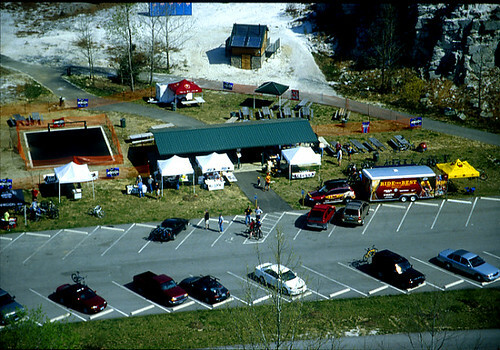 Klondike Park is located off of Highway 94 just a few miles east of the town of Augusta. From the Highway 40/94 interchange: Take Highway 94 South approximately 14 miles, past Defiance and Matson. The park entrance is on the left side of Highway 94. The park provides camper cabins, basic and primitive campsites, the Curt Loupe Conference Center, a fishing lake, a boat ramp to the Missouri River, natural areas, biking and hiking trails, access to the Katy Trail, picnic areas, a playground area, and observation areas with tremendous views of the Missouri River, surrounding forests and farmland in St. Louis and Franklin counties. 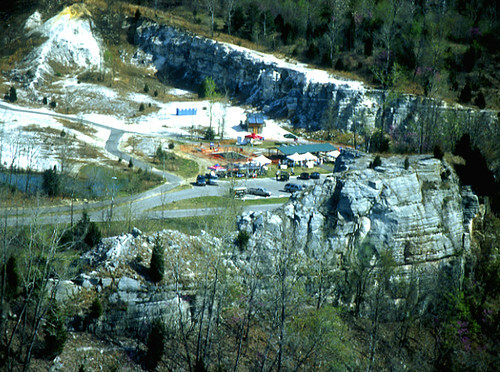 The park is approximately 250 acres in size and was a former quarry. 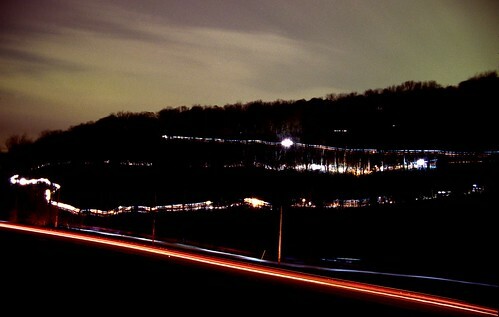 It was acquired by St. Charles County in 1999. There are lakes open to fishing, spectacular views overlooking the Katy Trail and Missouri River and beautiful wooded scenery. 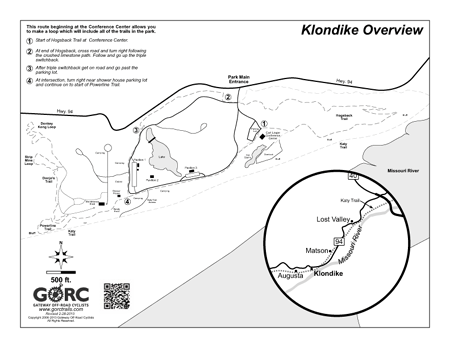 Klondike offers some of the best trail in St. Louis. Tight switchbacks, rollercoaster terrain, technical obstacles and adrenaline-inducing brushes against sheer bluffs will keep your heart racing. This park lies adjacent to Highway 94, the Katy Trail and the Missouri River. In the Klondike Park site has been heavily disturbed by quarry operations and is a study of nature's resiliency. The park includes: camper cabins, the Curt Loupe Conference Center, a fishing lake, boat ramp to the Missouri River, natural areas, basic and primitive campsites, biking and hiking trails, access to the Katy Trail, picnic areas, a playground area, and observation areas with tremendous views of the Missouri River, surrounding forests and farmland in St. Louis and Franklin counties. Just cleared all the cobwebs out of the west side! All Trails look good, Trees cleared on Hogsback.